The old section of Carcassonne, France is a walled, fortified Gothic village built on a promontory on the edge of Provence. 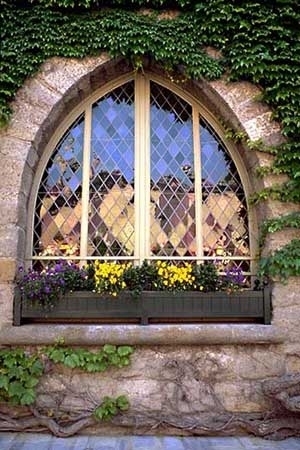 This beautiful Gothic-arched leaded-glass window was part of a hotel built into the thick stone walls of the village. The panes of glass are reflecting the buildings and outdoor restaurant across the way.